Designed to be easy to use, the unique swivelling action of the Maxi-Cosi Axiss rotates it 90 degrees to face the car door. This gives you clear, straight access for doing up your child’s harness, quickly and easily. It eliminates the need to stretch or twist when doing up the harness, so is kinder to your back. 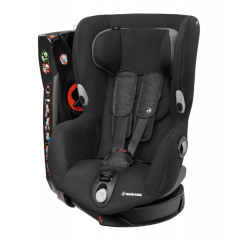 Smart and stylish, this innovative toddler car seat also has all the safety and comfort features you’d expect. 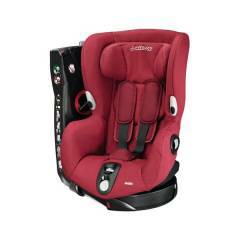 Suitable for ages 9 months to 4 years old (9-18kg) it fits using your car’s three-point seat belt. A handy belt tensioner and automatic locking means you can be confident of a secure fit. 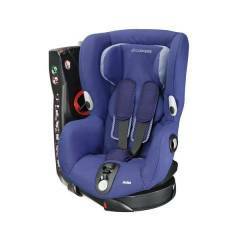 The swivel car seat design is also a great option if your car has less space in the back. Your child can easily climb in place and you can see clearly what you’re doing. When you’re done, it’s simple to twist the Maxi-Cosi Axiss back into place. A neat colour indicator lets you know it’s safely locked facing forwards so you’re ready to go. And you can choose to swivel to the left or right depending on which side of the car it goes. 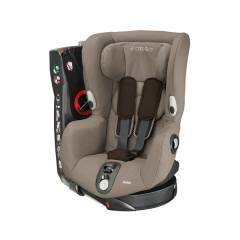 Meeting European car seat safety regulations, it's got extra safety features, like side impact protection, for your peace of mind. 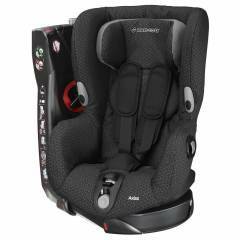 The headrest and harness adjust together from the front to quickly achieve a comfortable but secure fit. The choice of eight reclining positions, from upright to sleeping, gives you plenty of seating options. 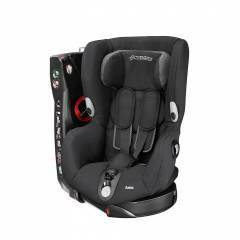 The seat and harness are padded so your little one can get comfy. And there’s a soft headrest for when it’s time to doze.